Alan Wake was a great game, but Remedy's Matias Myllyrine feels that there was confusion about what kind of game it actually was. It's no secret that Alan Wake didn't exactly set the world on fire when it came out in May. Despite receiving very positive reviews, sales were disappointing, especially compared to the likes of Red Dead Redemption and Super Mario Galaxy 2, which came out in the same month. Speaking to IGN, Remedy's managing director Matias Myllyrine blamed the lackluster sales not on anything to do with the game itself, but rather on Remedy's failure to tell people what made it worth playing. 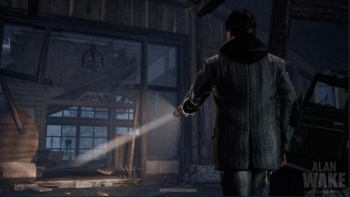 When it was announced in 2005, Alan Wake was an open-world game that let the player explore the town of Bright Falls and the surrounding area at their own pace. Remedy abandoned the open world aspect when it realized that it was very difficult to create tension without a very firm grip on the game's environment. Myllyrine said that he was very happy with the game's atmosphere and mood, but thought that Remedy could have done a better job of managing people's perceptions of the game, and backed those efforts up with stronger advertising that showed off the game's unique features. This isn't the first time that advertising has been blamed for Alan Wake's low sales figures. Back in July, Remedy's head of franchise development Oskari Hakkinen said that "extremely aggressive marketing" from Alan Wake's rivals had made May a "competitive launch window." The truth would seem to lie somewhere in the middle however, with too quiet a signal and too much interference from other games for Alan Wake to really shine.